Ken Colyer - and Studio 51. Ken and Chris Barber provided the beginnings of both trad jazz and skiffle music from the late 40's. He travelled to the US to learn about the New Orleans jazz style. Sandy Brown Jazz web site - full of information about Sandy and the UK jazz musicians who played in the fifties and later. Alexis Korner - the other half of the duo which pushed British folk blues and R&B music into the blues boom days of the early 1960s. Carlo Little - played drums with many groups including Lord Sutch and the Savages and Cyril Davies and the All Stars. A great site with lots of background information. Long John Baldry - the main vocalist in the Cyril Davies R&B bands. Alexis Korner - The Biography, was an indispensable reference for this site. Harry Shapiro is the author of a number of other acclaimed music books and rock biographies. Uncle Bob (Scruton) has been around playing guitar and singing blues for more years than he cares to remember. Malcolm Cecil is a Grammy Award winning musician, engineer, producer with his roots in British jazz and blues. Spike Heatley - Legendary British jazz bassist now living in France and still performing and recording! Geoff Bradford - guitarist extraordinaire - is one of the best kept secrets of the British Blues. 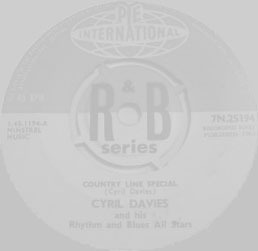 In the fifties, along with Cyril Davies, he was a pioneer of British Blues Music. The Graham Bond website - organist with Blues Inc and his own quartet with Jack Bruce and Ginger Baker. An educational resource about the development of blues music and its influence on pop music.